Gaja Kesari Yoga : is caused by Moon and Jupiter coming together in a horoscope by being in Kendras (1st, 4th, 7th, or 10th) from each other. Below are the list of articles those explains about Gaja Keser yoga and planetary combinations and results of Gaja Kesari yoga. Gaja Kesari Yoga is one of the auspicious yogas in Vedic Astrology. This yoga is formed in the birth-chart when Jupiter is in Kendra, i.e.,Ascendant, fourth, seventh and tenth house from Moon. Jupiter is the kaarak planet of wealth, knowledge, fame, luck and children while Moon is the kaarak planet of heart, softness, mobility, happiness and prosperity. Gajakesari yoga is also analyzed from Ascendant in the Kendra house. This yoga is auspicious when formed in Kendra houses. Gaja Kesari Yoga Jupiter should be in Kendra from Moon or Jupiter should be in Kendra from the Ascendant. In this yoga Jupiter should be in Kendra from the Ascendant or Moon. If Jupiter is aspected by auspicious planets it gives auspicious results. Rishi Parashar said that Jupiter should not be debilitated or in the enemy house. If Jupiter is in the enemy house or debilitated and the Gajakesari yoga is also created then the auspiciousness of this yoga may get affected. 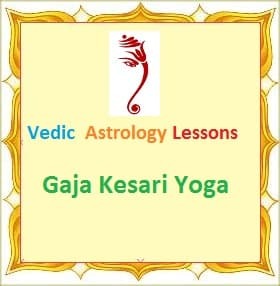 To read more about Gaja Kesari yoga in vedic astrology , click below articles.